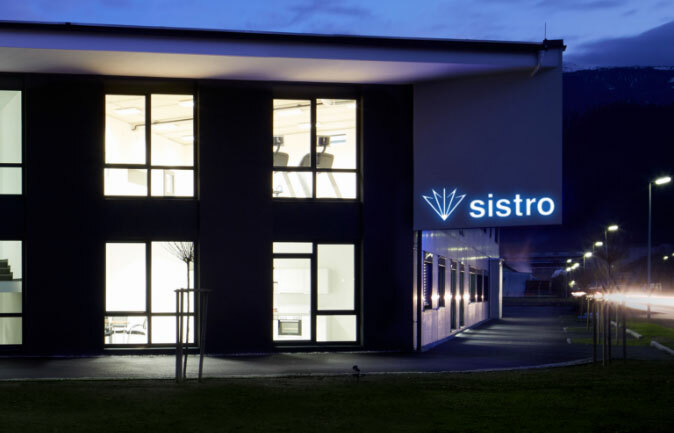 All information on our website has been carefully researched and checked by Sistro Präzisionsmechanik GmbH and is constantly updated. A liability or guarantee cannot be assumed for the provided information being correct, complete and up to date. The same applies to all other websites that are referred to by hyperlink. Sistro Präzisionsmechanik GmbH is not responsible for the content of the websites accessed in this way. © Copyright Sistro Präzisionsmechanik GmbH, Hall in Tyrol, Austria. All rights reserved. Text, images, graphics, sound, animations and videos as well as their arrangement on the Sistro Präzisionsmechanik GmbH websites are subject to the protection of copyright and other protective laws. The content of these websites may not be copied, distributed, modified or made accessible to third parties for commercial purposes. Some Sistro Präzisionsmechanik GmbH websites contain images that are subject to third party copyright. No licence to use the intellectual property of Sistro Präzisionsmechanik GmbH or third parties is granted through these websites. We hereby expressly distance ourselves from all contents of linked pages or graphics and in no way appropriate these as our own. Any violation of applicable laws, customs or morals that we become aware of will result in immediate deletion of links, entries, graphics or similar content. These terms and conditions apply to all legal transactions and legal relationships between Sistro Präzisionsmechanik GmbH as a contractor (hereinafter referred to as “contractor”) and the customer as a client (hereinafter referred to as “client”), unless the contracting parties have expressly agreed otherwise in writing. In particular, terms and conditions of the client are only valid if they have been explicitly acknowledged by the contractor in writing. Offers or orders are accepted by the contractor by written confirmation. Quotations are drawn up by the contractor to the best of its knowledge. However, no guarantee can be given for completeness and accuracy. Offers shall be subject to change, insofar as the Contractor may exceed the costs stated therein by a maximum of 10 (ten) per cent, if the Client does not object within 14 (fourteen) days to any relevant notification of excess cost. Delivery takes place EX WORKS (Incoterms 2010). Delivery / service periods are non-binding unless they have been expressly agreed as binding in writing in the order confirmation or in the individual contract. If the estimated delivery date announced by the contractor cannot be met or if any other changes relating to the delivery occur, then the contractor will inform the client without delay and announce the new estimated delivery date. If the contractor is unable to fulfil its obligations due to the occurrence of unpredictable circumstances, or circumstances for which it is not responsible, such as breakdowns, governmental actions and interventions, power supply difficulties, failure on the part of a supplier that is hard to replace, strikes, obstruction of traffic routes, delay in customs clearance or force majeure, then the delivery/performance period shall be extended appropriately. It is irrelevant whether these circumstances occur at the contractor itself or at one of his suppliers or subcontractors. Appropriate partial delivery and deviations of +/- 10% from the order quantity for serial deliveries are permitted. Invoices from the contractor to the client, unless otherwise agreed, are payable within 30 days. If payment is made within 8 days, a discount of 2 per cent will be granted. For partial deliveries, the contractor may submit partial invoices. In the event of late payment, the statutory default interest for business dealings (currently 9.2% above the base rate) shall apply. A processing fee of at least EUR 7.00 per reminder will be charged. In the event of the agreement of part payments, a missed payment deadline arises even if only one part payment is late or not paid in full. In the event of a missed payment deadline, the entire outstanding balance is due for payment immediately. With a missed payment deadline, the contractor has the right to take the goods delivered under retention of title into custody without withdrawal from the purchase contract until the entire claim is fully covered including ancillary costs. The contractor is entitled to demand a higher than agreed remuneration or purchase price if the calculation bases existing at the time of placing the order, such as raw material prices, the exchange rate or collectively agreed personnel costs, change after the conclusion of the contract. All prices and charges, unless otherwise stated, do not include the applicable statutory VAT. The benefits agreed upon on conclusion of the contract, such as discounts, are granted on condition of timely and full payment. In the event of default, even with a partial service, the contractor is entitled to charge for it. The assertion of a right of retention and defence of a non-fulfilled contract by the client in case of alleged defects is excluded. Offsetting by the client with counterclaims or claims for price reduction claims is only permissible if the claim has been legally established or has been recognised in writing by the contractor. If the financial circumstances of the client deteriorate, then the contractor is entitled to make the agreed remuneration or the purchase price due immediately and to execute the order only against advance payment. The place of performance is the registered office of the contractor. The risk is transferred to the client as soon as the contractor has the object of the purchase / plant ready for collection in the plant or warehouse, regardless of whether the goods are handed over by the contractor to a carrier or forwarding agent. Adequate transport insurance will only be taken out upon written request from the client. All goods and products shall remain the property of the contractor until full payment has been made by the client, even if the items to be delivered or manufactured are resold, altered, processed or mixed. In the event that the client acquires the property of the contractor by combining or mixing with other movable property into a single new item under the latter’s sole or co-ownership, it assigns the contractor the property to secure its claim with the simultaneous commitment to properly safeguard the new item for the contractor without charge. Until full payment of all claims of the contractor, the object of performance/purchase must not be pledged, assigned by way of security or otherwise encumbered with third-party rights. In the event of seizure or other claim, the client is obliged to point out the property right of the contractor and to inform it immediately. In the event of resale of the goods subject to retention of title or of new goods produced from them, the client shall also inform the purchaser of the contractor’s property. The warranty period is limited to six months and begins from the transfer of risk in the sense of these terms and conditions. The existence of defects must be proven by the client; any other legal provisions regarding a presumption of deficiency do not apply. No warranty claims exist for defects caused by improper handling or overuse; if statutory or contracted operating or installation instructions are not followed; in the event of incorrect or absence of assembly or commissioning by the client or third parties, in the case of natural wear, transport damage, improper storage, functionally disturbing operating conditions (e.g. inadequate power supply), chemical, electrochemical or electrical influences, if necessary maintenance has not been carried out, in the event of poor maintenance or defects caused by comparable acts or omissions. Notifications of defects and complaints of any kind are – in the event of other loss of warranty claims – to be notified immediately, stating the possible causes in writing. Verbal, telephone or not immediately made notifications of defects and complaints are not considered. After execution of an agreed acceptance, a complaint regarding defects that were ascertainable at the time of acceptance is excluded. If goods or works are manufactured or processed on the basis of information, drawings, plans, models or other specifications of the client, then the contractor shall guarantee only those implemented in accordance with the specifications. If changes are made to the delivered object of purchase or works by the client without the prior written consent of the contractor, then the guarantee obligation of the contractor expires. In the event of a warranty, the contractor is entitled to determine the type of warranty (improvement, replacement, price reduction or conversion). The contractor is only liable for intentional or grossly negligent damage. Liability for minor negligence is excluded except for personal injury. The fault of the contractor must be proven by the client. Liability for indirect damage, consequential damage, loss of profit, financial loss, damage due to business interruption, loss of data, interest losses as well as damage due to claims of third parties against the client is excluded under all circumstances. Any liability of the contractor is limited in any event up to the amount of the agreed fee or the purchase price for the respective contract. The contracts taken over by the contractor are only accepted with the reservation of this limitation of liability. Any further liability of the contractor is expressly excluded. The client must immediately inform the contractor about discovered defects of the goods or the work in the event of any loss of any other claims. In any case, claims for damages shall expire unless asserted in court within six months. In the event of non-compliance with any conditions for installation, commissioning and use or the official approval conditions, liability is generally excluded. In any event, if a penalty has been agreed at the expense of the contractor, this is subject to the judicial moderation law and the assertion of damages beyond the penalty is excluded. If a delivery/service is not possible due to reasons for which the client is responsible or if the client does not comply with a statutory or contractual obligation towards the contractor, the contractor is entitled to withdraw from the contract. In this case, the client shall compensate the contractor for any resulting disadvantages and loss of profit. A withdrawal from the contract by the customer due to default in delivery is only possible after setting a reasonable grace period, but at least one that corresponds to the originally announced delivery period. The withdrawal must be asserted by registered letter. The right of withdrawal relates only to the part of the delivery and service with regard to which there is a delay. The client waives the contestation/adaptation of this contract due to error. With the proviso of the following provisions, the aforementioned provisions also apply to the acceptance of an item provided by the client for processing by the contractor: If the contractor takes over an item provided by the client to carry out work commissioned by the client, it is not obliged to check and warn the client whether the object is suitable for commissioned work or processing. A warning obligation of the contractor exists only if the unsuitability of the provided item is so obvious that it can be determined without examination. Incidentally, the liability of the contractor for damage to the goods provided is limited in any case to the order value of the processing. The client is responsible for ensuring that any design information, drawings, models or other specifications provided for production do not interfere with third-party property rights. In the event of any infringement of property rights, the client shall indemnify and hold the contractor blameless. Software, design documents, such as plans, sketches and other technical documents, as well as samples, catalogues, brochures, illustrations and similar remain the intellectual property of the contractor and enjoy copyright protection. Any reproduction, distribution, copying, processing or exploitation not expressly permitted is prohibited. The contractor is entitled to make any plans, sketches, etc. provided by the client available to its subcontractors in anonymous form for performance or execution. In any event, the contractor will conclude corresponding confidentiality agreements with these subcontractors in advance. Changes or additions to a contract concluded between the client and the contractor must be made in writing. This also applies to a deviation from the written form requirement. A complete or partial transfer of the rights and obligations of the client from the contract concluded with the contractor to third parties requires the written consent of the contractor. Should any provision of these terms and conditions be or become invalid, this shall not affect the validity of the remaining provisions. Ineffective provisions are to be concluded by the contracting parties as a result of one of the ineffective provisions as far as possible and customary in the industry. The place of jurisdiction for all disputes arising from the contractual relationship or future contracts between the contractor and the client is the court with jurisdiction for the registered office of the contractor. The contractor is also entitled to take legal action at the general place of jurisdiction of the client. The contract parties agree on the application of Austrian law. The application of the UN Sales Convention is excluded by mutual agreement. Changes of name, company, address, legal form or other relevant information must be communicated to the contractor immediately in writing.